Microsoft Outlook Installation is Required to save recovered data in PST file. Supports all the versions of Windows Outlook including Outlook 2016, 2013, 2010 and 2007. 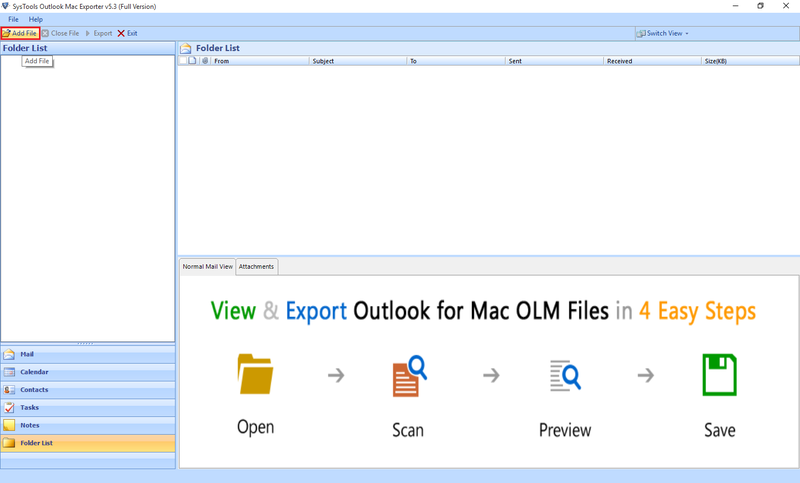 OLM Repair tool provides multiple distinct option to save repair data of Mac Outlook 2016/2011 in EML & PST file formats. It also provides ease to save selective data into desired file formats.The Outlook Mac Recovery software allows you to save multiple emails from .olm file into .eml format. Also, it will embed the attachments of each email after you repair corrupted olm files them from Outlook Mac OLM file into output EML file. You can repair inaccessible .olm files & convert emails from the Deleted Items folder of the OLM file. This helps you to completely restore OLM file emails even when user forgets items stored in Deleted Items folder. Thus, it is possible to recover emails from Deleted Items folders as well as from Sent Items, Drafts or any other customized folder. The OLM Repair tool allows you to maintain original folder hierarchy while repairing Outlook Mac data file. You are provided with an optional feature of keeping the folder hierarchy maintained. You can select "Yes" or "No" as per your requirement. If you enable the option to maintain the folder structure, software will save resultant EML files with the same folder structure as that of your OLM file. OLM data recovery software also facilitates to recover permanently deleted emails of Mac Outlook 2016 & 2011. After the successful recovery of data, user can save recovered data from corrupted OLM in multiple file formats such as PST or EML. Mac Outlook database recovery tool supports the latest Outlook for Mac 2016. It can easily repair and recover deleted files of Mac Outlook 2016 without any issue and allows to save recovered data in PST or EML file format. Once the OLM formatted emails are converted to EML format and stored in a safe location; user can easily import them to supported email clients. Further use of the files can be done on clients like; Outlook Express, Windows Mail and Windows Live Mail, client respectively. Simply by drag and drop you can import EML files collectively in desired folder. After the completion of the process to repair OLM file and saving MS Outlook Mac emails into EML format, the OLM recovery tool generates a small summary of the same. 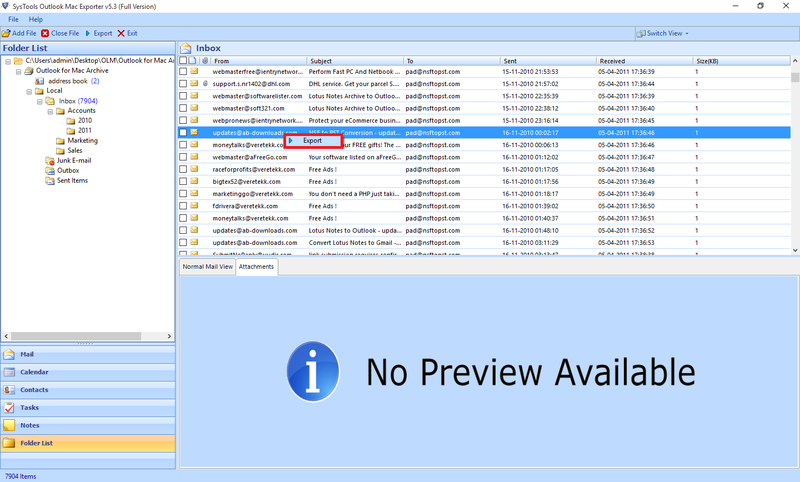 This report will show you details like: Exported email count, current folder path, current folder being processed, and current email subject name; to notify you about related information. Demo version of Outlook Mac Recovery Software can export & Save 25 Outlook 2011/2016 items to PST file. Shall I run this tool on the machine where Outlook Mac is installed? No, this software should be installed on a Windows machine of any version and doesn't require Mac Outlook to be operated. Does this software also repair corrupted OLM files? 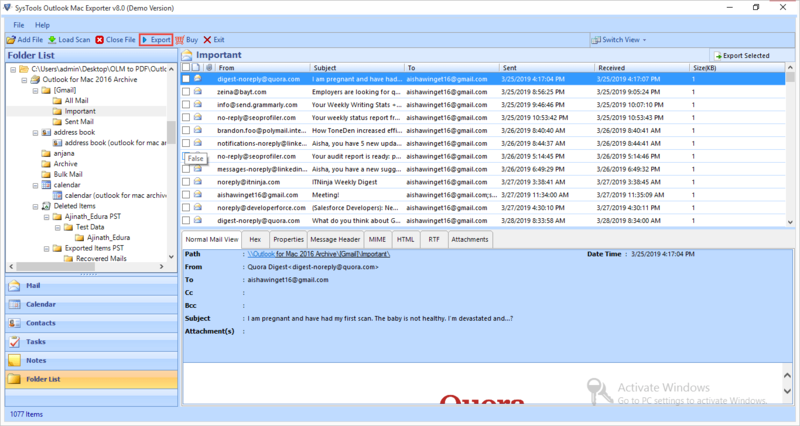 SysTools OLM repair tool easily fix inaccessible OLM File emails and convert OLM to PST file format successfully. How many OLM files can be converted to EML format with this tool? You can convert one OLM file at a time into EML format using SysTools Outlook Mac Recovery tool. Is there any external software required to repair Microsoft Outlook 2011 mac? Yes, this OLM recovery tool requires installation of Microsoft Outlook if you want to save recovered data in PST file format. What is the maximum OLM file size supported by the software? This software can save recovered data of Mac Outlook into EML or PST format. There is no such file size limitation or performance issue within the software. How to use this software for OLM files stored on Mac machine? You just need to copy OLM files from Mac machine to a Windows machine with the help of any removable disk. 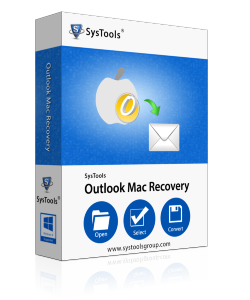 Install and run SysTools OLM Mac Recovery on the respective Windows PC, you will get recover deleted email of outlook mac 2016 into EML or PST file format..
Is folder hierarchy of source OLM file maintained even after conversion? 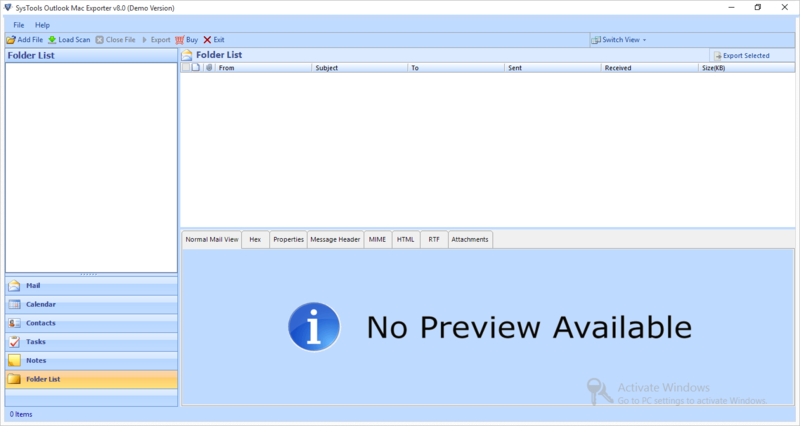 SysTools Outlook Mac OLM Repair tool has options to maintain or not folder hierarchy as per users need. You can choose from the option'Yes' or 'No' as per your requirement before conversion. I was highly impressed by the trial version & was able to repair corrupted OLM file and it was the sole reason why I bought the tool. Unless I was not able to trust in its ability, but thank god a trial was offered which was fair enough. Luckily I got a tool that will come in great use for users like me. I lost some of my important Mac files and tried various solution that are available over the internet but none of them worth using. At-last one of my friend suggest me to use this OLM recovery tool. And really this is an amazing tool, it recovers all my corrupted Outlook Mac data items successfully.